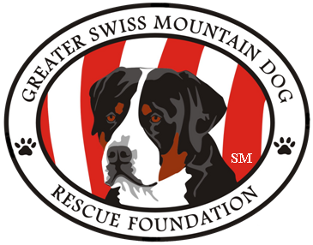 Welcome to the Greater Swiss Mountain Dog Rescue Foundation! Here at the Greater Swiss Mountain Dog Rescue Foundation, or GSMDRF, we are dedicated to the well-being, rescue, and re-homing of Greater Swiss Mountain Dogs. We believe that the GSMD should not have to suffer a life of being shelter dogs, or dogs that are homeless. With this in mind, we are committed to being there for every Greater Swiss Mountain Dog that needs the help of the GSMDRF, even after being placed in their forever homes. Our mission statement is located here. The GSMDRF is a 501(c)(3) volunteer-run and not-for-profit organization that was set up by the Greater Swiss Mountain Dog Club of America in February 2009. If you are interested in adopting a Swissy, the first step in the process is for you and your family to submit our adoption application. All applicants will receive a confirming e-mail. Please do not call to inquire about the availability of a Swissy. Potential adoptive homes are selected from applications on file, and we attempt to match dogs with families based on the application information. There are many rescue organizations and it can be confusing to know whom you are dealing with since some may have similar names. The Greater Swiss Mountain Dog Rescue Foundation has been granted 501(c)(3) status by the IRS and is the ONLY Greater Swiss Mountain Dog rescue organization recognized by the Greater Swiss Mountain Dog Club of America and listed on AKC's website (www.akc.org/breeds/rescue.cfm). If it is your intention to seek assistance from or make a donation to The Greater Swiss Mountain Dog Rescue Foundation, you should verify that you are dealing with the correct organization. The following information may help you to verify that. THE GREATER SWISS MOUNTAIN DOG RESCUE FOUNDATION (GSMDRF) is a board of four unpaid volunteers who are responsible for the rescue and subsequent re-homing of purebred Greater Swiss Mountain Dogs. The members of the board are Pat Saxon, Barry Goldstein, Bonnie Huett and Cheryl Gerzabek. Any initial contact will always be from one of us. We don't post our rescue dogs on our website, any social media or any other "rescue" site nor do we solicit donations for any specific dog. So if you see a Swissy posted on any other rescue site or see postings asking for donations for a specific dog it is not coming from the GSMDRF and we encourage you to verify the validity of the post. The GSMDRF pays all medical expenses for Swissies in foster care, which in some cases can be a significant expenditure, from funds available through previous generous donations. We do whatever is necessary for each dog in our care to provide a successful transition to his or her forever home. If you are seeking assistance in connection with the surrender or rescue of a Greater Swiss Mountain Dog, please either e-mail us at rescue@gsmdrescue.org or call Pat Saxon H: (941-322-9294) or C: (410-591-4412) or Barry Goldstein (480-982-5713) to ensure that you are dealing directly with the The Greater Swiss Mountain Dog Rescue Foundation.